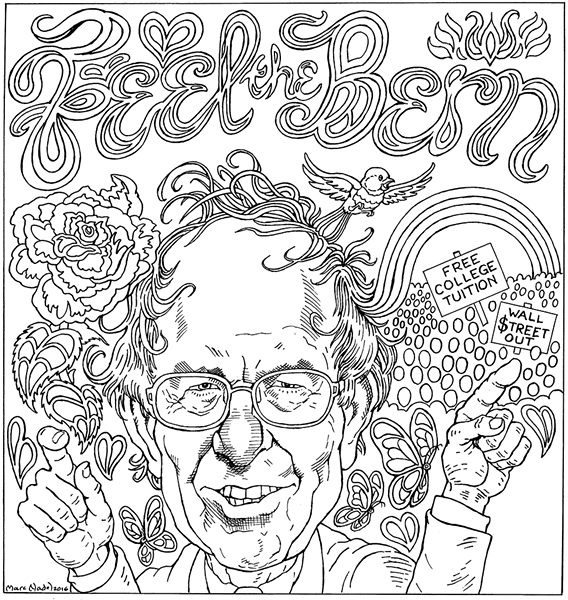 Feel the Bern: An Adult Coloring Contest! Download the .pdf, print it out, color it, send it back! You surely know by now that adult coloring books are a thing. And if you don’t, you need to go to bookstores more often. There you’ll find a plethora of slim volumes whose purported mission is your relaxation. Yes, people, it is therapeutic to just let go and color inside the lines. But that doesn’t mean you can’t be competitive! Welcome to the Seven Days adult coloring contest. Feel free to get creative and indulge your color palettes on this caricature of Sen. Bernie Sanders by local artist Marc Nadel. Any medium is acceptable. Mail your paper submission or email us a high-resolution scan by Thursday, July 14. 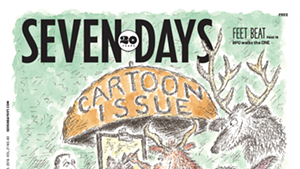 Seven Days staffers will vote for our favorites, and we’ll display the winner(s) in the July 20 issue. First prize: gift certificates worth $100+ to local restaurants! or, email it to adultcolor@sevendaysvt.com. Include your name, email address and phone number.